An efficient transport system is a vital requirement for economic development and provides personal mobility for activities such as work, education and leisure that are key ingredients of modern life. But transport also contributes significantly to several environmental (and health) problems, particularly climate change, acidification, local air pollution, noise, land take and the disruption of natural habitats. It is a major consumer of fossil fuels (which make up some 99% of the sector. s energy consumption) and other non-renewable resources. Figure 0.1 shows the contribution of the sector to total energy consumption and some important air emissions. Added to this, road traffic accidents continue to be a major cause of death (typically 44 000 a year in the EU alone), injury and material damage. These problems not only constitute an important sustainability concern, but also represent significant economic loss. Until recently, the main instrument used to abate the environmental impacts of transport has been environmental regulation, mainly through the setting of vehicle and fuel-quality standards. However, it has become clear that such . end-of-pipe. approaches (mainly taken by environment ministries) are not sufficient to meet current and probable future international and national environmental targets. What is needed is a change in policy-making to a greater focus on preventative or controlling measures (e.g. road pricing) taken by the sectoral (transport) ministries. Integration strategies were outlined in the EU. s fifth environmental action programme (5EAP) (CEC, 1992) and have been given a high political priority following the Treaty of Amsterdam, which identifies such strategies as a way to achieve sustainable development. The integration process was given a renewed impetus with the Commission. s 1998 Communication on Integration (CEC, 1998a). However, progress has been slow: a recent report on the environment in the EU shows that the transport sector, which is continuing to grow rapidly, is jeopardising the EU. s ability to achieve many of its environmental policy targets (EEA, 1999a). additional initiatives to reduce environmental impact (e.g. improving eco-efficiency, influencing driving behaviour). Clearly, such measures are closely interlinked and are most effective when combined in a comprehensive strategy. The action plan of the Common Transport Policy (CTP), which was initiated in 1995, constituted a first step in this direction (CEC, 1995; CEC, 1998b). Its aim is to ensure . sustainable mobility. within the EU, i.e. to encourage the development of efficient and environment-friendly transport systems that are safe and socially acceptable and make less demand on non-renewable resources. It contains some strategies which might in the longer run help to reduce or reverse unfavourable trends, for example fair and efficient pricing, promotion of intermodal and combined transport (i.e. combinations of rail/road/inland waterway/maritime transport using intermodal units), the revitalisation of rail and other less environmentally harmful modes (non-motorised transport, inland waterways, maritime transport), the improvement of public transport and making better use of existing infrastructure. Implementation of these strategies, however, is facing many difficulties, and their impact is not yet reflected in any significant change in transport activity. At the national level, only a few Member States have adopted and implemented integrated transport strategies. The European Council, at its Summit in Cardiff in 1998 (and the subsequent meeting in Vienna, 1998) therefore urged the Commission and the transport ministers to enhance their efforts to develop integrated transport and environment strategies. A key requirement for this process is a system for regular monitoring and reporting of the effectiveness of integration strategies and progress towards a sustainable transport system. In June 1998, the Joint Transport and Environment Council therefore invited the European Commission and the European Environment Agency to set up an indicator-based Transport and Environment Reporting Mechanism (TERM). This report, TERM 2000, is the first of a series of regular reports on the transport sector and is likely to set the pattern for similar reports covering other economic sectors. It is based mainly on databases available within Eurostat and the EEA. An important aim has been to inform the Helsinki summit of the Council under the Finnish Presidency on the progress of integration in the transport sector. Though constrained by current data shortcomings, it contains clear messages which can support policy makers in developing further integration strategies. Another aim is to initiate actions to improve data collection systems, both at EU and Member State level. The report will therefore also be used as a consultation document: it will be widely disseminated to the Member States, thus allowing users and interest groups to contribute additional information and ideas. The TERM process is expected to develop over a number of years, during which time data, indicators and assessment methods will gradually be improved. It is managed by a Steering Group consisting of the Commission (Transport DG, Environment DG and Eurostat) and the EEA. Its technical implementation is an EEA-Eurostat cooperation. A regular indicator-based report on transport and environment in the EU, of which this is the first and, to some extent, a . try-out. version. The proposed indicators are intended for use primarily by European Community institutions, ministers and policy-makers in the Member States. The reports will be used to monitor the degree of environmental integration in the EU transport sector, progress towards a transport system more compatible with sustainable development, and the effectiveness of the various policy measures. They will also provide a common basis for countries to compare performance (benchmarking). A statistical compendium, prepared and published by Eurostat, which contains a detailed overview of most of the data (with national breakdowns) that is used for compiling the indicators. As far as possible, all the major modes of transport (road, rail, inland waterways, aviation, maritime and pipelines) are covered (Eurostat, 1999). A series of focus reports on specific policy topics that require a more detailed approach than is possible in the annual indicator-based reports. A number of in-depth studies to support the gradual improvement of specific indicators and methods, the findings of which will be reported in technical reports and papers. Towards a transport and environment reporting mechanism for the EU (EEA, 1999b, developed in cooperation with Eurostat): describes the TERM methodology and process, and includes some preliminary indicator sheets which give an insight to the main data and methodological issues for each indicator. TERM feasibility study (ERM, 1999a): gives a detailed assessment of current data availability, other national and international indicator reporting systems for transport and the environment, and international and national targets for transport and the environment. The study affirms the need for substantial data improvement and for a number of specific studies, including methodological studies to improve the TERM indicators and assessments, and focus reports addressing relevant policy issues. In addition, a multi-year action programme is presented, outlining the major tasks that need to be undertaken to improve data availability. Throughout the TERM process, there will be coordination with national initiatives. The Member States are consulted through the Environmental Policy Review Group and the expert group on transport and the environment (established by the Transport and Environment DGs). At the technical level, EEA and Eurostat are using their existing networks to obtain data and information from Member States, the EEA working with its European Information and Observation Network (EIONET), and Eurostat with national statistical offices. TERM is also being coordinated with other international transport and environment initiatives: the UNECE programme of joint action in the area of transport and the environment, WHO. s follow-up work on transport, environment and health (i.e. implementation of the London 1999 Charter) and the OECD programme on environmentally-sustainable transport and the European Conference of Ministers of Transport (ECMT) statistical and environmental activities. At the core of TERM is an ideal list of 31 indicators, which were selected following consultation with various Commission services, national experts, other international organisations and researchers (Table 0.1). 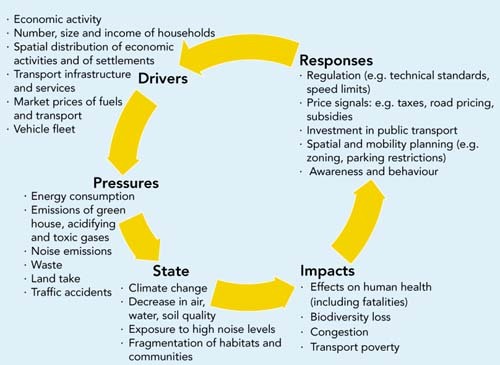 The indicators cover the various elements of the DPSIR analytic framework (Driving forces, Pressures, State of the environment, Impacts, societal Responses), which the EEA uses to show the connections between the causes of environmental problems, their impacts, and society s responses to them, in an integrated way (Figure 0.2). The indicators are grouped according to seven policy areas where integration should take place. Each group should help to answer a key policy question (see Box 0.1). 2 Are we getting better at managing transport growth and improving the modal split? Are spatial and transport planning becoming better coordinated so as to match transport demand to access needs? 4 Are we improving the use of transport infrastructure capacity and moving towards a better-balanced intermodal transport system? 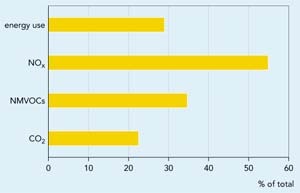 5 Are we moving towards a more fair and efficient pricing system, which ensures that external costs are recovered? 6 How rapidly are improved technologies being implemented and how efficiently are vehicles being used? 7 How effectively are environmental management and monitoring tools being used to support policy and decision-making? The indicator set is still evolving, and to some extent, is a long-term vision of what an ideal indicator list should look like. The current list includes some indicators which cannot as yet be quantified, as a result of data limitations. The indicators that are presented in this first report do not, therefore, always fully match the proposed list. Where data availability has prevented an EU15 analysis, national examples are given, or proxy indicators are used. Future actions to improve data availability are outlined on the individual indicator sheets. Table 0.1 gives an indication of when the final indicators may be achievable and an assessment of the quality of current data. The TERM work programme aims to improve the indicator set and ensure that it is well matched to the needs of users in the Commission and the Member States. As TERM aims to assess progress towards integration of environmental considerations into transport policy, indicator trends have been evaluated against a number of . integration. objectives and targets. These were drawn from international policies and plans, such as the 5EAP, the Common Transport Policy, environmental Directives, various other international conventions and agreements, and the OECD. s work on environmentally sustainable transport (OECD, 1996, 1999). Additional national objectives and targets were obtained from a review of national regulations and transport and environmental policy documents and plans. Most of the targets used in analysing progress have been brought together in the EEA. s STAR (Sustainability Targets And Reference values) database, which can be consulted on http://star.eea.eu.int/ (ERM, 1999b). Since the proposed indicators are intended for use mainly by European Community institutions and Member States, a balance had to be sought between EU aggregation and national assessment needs. Evaluation of progress towards integration in terms of the various indicators includes a consideration of both EU and national performance where data availability has made this possible. For each group of indicators an overview summarises the main messages for the entire group and clarifies linkages between indicators and with other groups. The overview provides messages which are not always discernible from the analyses of individual indicators. Within each group, one or two key indicators are highlighted, to reflect their importance for measuring the success of policy levers. For each indicator a sheet sets out the key message, the indicator definition and the major EU and Member State policies, objectives and (quantified) targets. Findings are presented at the aggregated EU level, and, where data is available, at the national level. Historical trends are analysed and a (qualitative) . distance-to-target. evaluation is made. The main issues (data limitations, methodological problems, gaps in the policy framework and targets) are listed, together with recommendations for future work. A data breakdown by country and other more detailed data can be found in the Eurostat Statistical Compendium. This should allow the Member States to have a view of the data situation in their country, and to target their data improvement actions in the future. An overall assessment provides a comprehensive evaluation of the seven groups, drawing together common themes and messages, makes recommendations for future work and presents an action programme for the future. For references, please go to https://www.eea.europa.eu/publications/ENVISSUENo12/page004.html or scan the QR code.